Today marks the first day of the second trimester! The first one has been pretty rough for me, at least compared to how it went with the girls – all day nausea, food aversions like you wouldn’t believe, headaches, exhaustion, etc. The nausea’s intensity has definitely waned, but it’s still there. Let’s hope the word gets out that the second trimester is here. We had an appointment on Tuesday with our amazing OB, and everything looks great. The baby had a strong heartbeat and there was a nice amount of uterine growth. 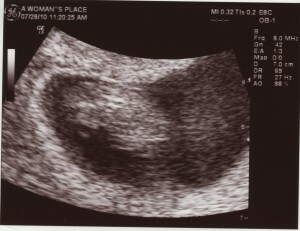 On Wednesday, we had the scan and bloodwork done for the nuchal translucency, and the scan was awesome! In just 4 weeks, the baby grew from a little blobby looking thing to a tiny little BABY, with arms, legs, hands, feet, a little mouth that opened and closed… Even the third time around, it’s thrilling to see. The measurements suggest a very low risk of Down Syndrome (though we need to bloodwork results to get a better sense), and the baby was only measuring 2 days ahead, which is tiny, given our history with big babies. 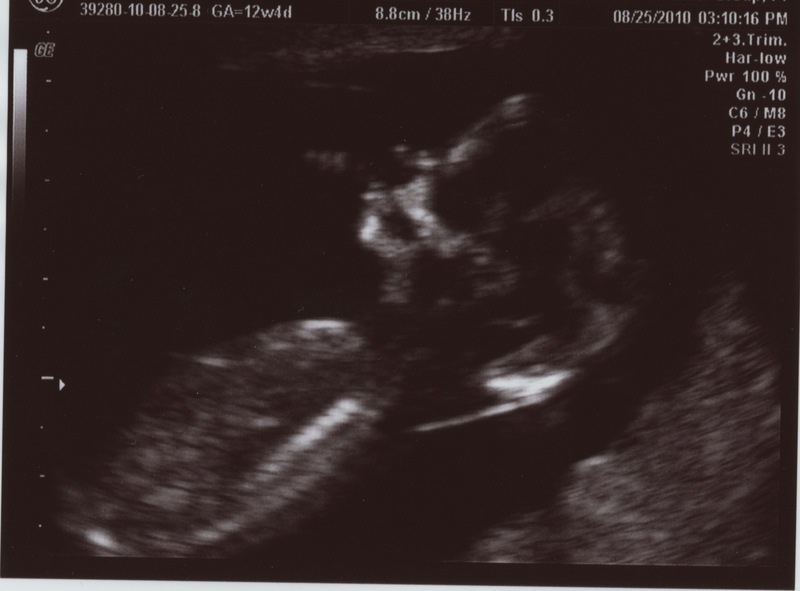 The other exciting news is that both the tech and the doctor felt fairly confident that we are going to have a boy. We’re a quarter of the way there already, and I can’t say I’m sad it’s going somewhat quickly. This first trimester seems considerably more rough than it was when I was pregnant with Anya and Sierra. I’m nauseous from morning to bedtime and unbelievably tired. I’m having major aversions to pretty much all food. This is the first time I’ve had a summer first trimester, and I don’t think this crazy heat has been helping much. I’ve had two appointments with the doctor so far. The first was unplanned – I started having some increasing pain on my right side the day before I hit 7 weeks and they had me come in to be checked, but thankfully the scan showed that everything was fine and the working theory is that the pain is being caused by pressure on scar tissue from my appendectomy. My next appointment was my first “official” prenatal appointment with a full exam. Everything looks wonderful (see above scan). 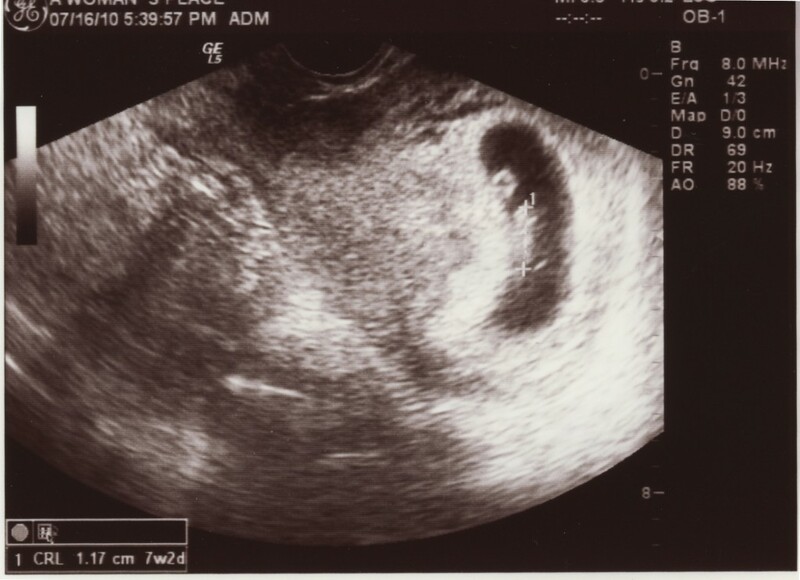 The baby has a strong heartbeat and was already measuring a full week ahead. No weight gain for me yet. We told our parents the good news, but are still waiting a few more weeks to tell the rest of our family and our friends. We also told Anya and Sierra. Anya understands and is very excited, although she is convinced that we are having a boy because she “already has a sister” and therefore we MUST be giving her a brother this time. Sierra will tell you there’s a baby in my belly (and she likes to give it kisses, but she was already obsessed with giving my belly button kisses) and that she’s going to be a big sister, but does she understand? Not so much. Sierra is six months old (and then some)! I am so sorry your six months update is two weeks late. Can I blame the demands of packing up an entire house for the delay (even though Daddy is doing much more work than I am)? Sweet little Sierra is already 6 months old! That’s HALF a YEAR. Wow. She had her checkup a few weeks ago – 16 lbs, 5 oz, and 26 1/2 inches. I switched her over to her 6-9 months clothes about a month ago. She probably could have continued to wear her 3-6 months things a little longer, but I have a much better summer selection in the larger size. For reasons I don’t quite understand, she is now wearing a SIZE 4 diaper! How is that possible? Anya was bigger than Sierra at the same age, and Anya didn’t start wearing size 4 until she was fourteen months! At six months, Sierra wasn’t at all mobile. Now, she is pushing herself backwards (not quite intentionally) and spinning herself in circles (definitely intentionally), and she’s at least thinking about trying to crawl. She finally rolled from her back to her belly a few days after her six month birthday, but she’s only done it a few times since then. At six months, Sierra was sleeping in our room, often in our bed, and waking every two hours or more. Since then, we moved her to her crib – which was extremely bittersweet for me – and each night is getting a little better. Last night she slept from 8:2o pm until 2 am without waking up! She still ends up in our bed sometime around 4 am, but we’re okay with that. I kind of look forward to it. Oh, and she’s been sleeping on her belly for the last week or so. At six months, Sierra wasn’t eating much of anything solid, aside from gnawing on cucumbers or apple slices. In the last week, she’s become a bit more open to eating baby food. She doesn’t eat much – maybe two teaspoons or so. She doesn’t open her mouth very wide, almost using the spoon like a straw, but she’s still getting something and has seemed to like everything she’s been offered so far except bananas. It does seem that she would REALLY prefer to eat table food, but she gags on almost everything except puffed rice cereal, so she’s going to have to be a bit more patient. At six months, Sierra was toothless, but two days ago she cut her first tooth! Some things are still the same. Sierra still loves to clap her hands, and waving is making a comeback. I’m fairly certain she signs “milk” now and sometimes it seems like she’s trying to sign “more” (but it looks like clapping so it’s hard to tell). She still doesn’t put anything in her mouth other than her hands. We asked the doctor about that at her appointment, and he said that while it’s not typical, it’s nothing to cause concern. She certainly loves to grab anything within her reach and shake it, bang it, crumple it – whatever seems fun! She also adores jumping, whether it’s in her jumper or on my lap. And let’s not forget shrieking! There’s been no change in that. She doesn’t really babble yet – we get a consonant here and there, but mostly we hear a lot of shrieks, Mmmmms, Has, and another favorite sound – Bpfffft! TMI About Poop Section: Last thing – and Lex and I disagree about this – Sierra’s has some tummy issues. Basically, she consistently has explosive, giant, pure liquid poops that leak right through the liner of every diaper we try. Part of moving her up to size 4 was because I needed a bigger diaper to contain the mess (although they do fit her better anyway and frankly, they still don’t contain it unless I change her the second after she poops). This was my main concern at her six month appointment, and the doctor – our favorite in the practice – felt that what I described was in the range of normal for a breastfed baby. After giving it a few days more thought, I decided I really don’t think it’s normal and we brought her back for a second opinion with another doctor in the practice, this time with a diaper to illustrate the problem. He also isn’t particularly concerned, but he suggested that we bring her to a pediatric gastroenterologist to rule out any real problems and mainly to put my mind at ease. Unlike Anya, who also had this problem at this age due to a colitis medication I started taking then, Sierra has had this issue on and off since birth, but without an obvious correlation to the medication (which I began taking again when she was about two months old). Thankfully, also unlike Anya, Sierra has not lost any weight. I think part of what contributes to how explosive it all is is that Sierra generally only goes once a day, sometimes skipping a day, even skipping THREE days. I know that the pattern itself is normal, but I have a hard time believing that I just have to accept that every poop-filled diaper is going to leak because of how liquidy her poops are. I spend the day dreading the inevitable deluge, especially when she holds it in until the evening. At least when she goes in the morning I don’t spend the day waiting for it; I can put her in clothes without thinking about how easily I’ll be able to get them off of her in a public place if they end up covered in poop. I can’t imagine taking her in the pool this summer – no swim diaper is going to contain that mess. In my gut, I don’t think that this is normal, but if the pediatric GI tells me it is, I will believe him – but I don’t have to like it! Her appointment is scheduled for the first week in August, though we’re on the cancellation list and may end up being seen sooner. At ten weeks old, Sierra is already sick for the first time 🙁 It looks like she caught Anya’s cold, though she doesn’t have it anywhere near as bad as Anya or Lex – she and I got off easy, compared to those two. She’s congested, but her nose isn’t really running and using an aspirator doesn’t produce much of anything. She must have a pretty bad post-nasal drip, though, because you can hear how congested she is when she breathes, especially when she’s lying on her back. She’s been sneezing and coughing, but the worst part is that she keeps gagging on whatever’s running down her throat, and it makes her spit up everywhere. I don’t even know if you could call what she’s producing spit up and not vomit since there is SO much of it, and it comes up so soon after eating that the milk looks the same coming out as it did going in. Poor baby. Last night I ended up holding her on my shoulder from 3 am on because she was so miserable on her back, but tonight she’s in the Co-Sleeper and it sounds like she’s breathing more easily, so hopefully she’s already on the mend. She hasn’t had any fever and aside from an hour or two tonight when she was very cranky, she’s been in a good mood. We’re in the home stretch. I’ve been trying to do some productive things like washing the clothes, linens, etc. I raised the crib back up and put on the bedding. I also washed the car seat liner and installed one of the two bases. I still have to put the carrier back together and install the other base. There are plenty of other things to get accomplished before the baby gets here – and that could be very soon! This past Monday we had our first childbirth “class” with our doula. I like her very much and think it was a good choice for us to hire her. The first part of the class was spent going over things like how our views of “normal” labor compared to societal views. That might not have been the most useful time we ever spent, but the second half was used to practice some relaxation techniques (many of which involved a birth ball). I felt like these were helpful and much more concrete than anything we talked about at our Bradley class for Anya. We had an appointment on the 16th that went well. Baby Girl’s heartrate was 134 bpm; my blood pressure was great and I weighed in at 123 lbs. No protein in the urine and the baby was head down. We still really like the doctor. Our next appointment is Wednesday. We’ll meet the other doctor in the practice then. I’m glad we have an appointment because around Friday night I realized that I no longer felt kicks on my upper right side but rather on my lower left instead. I also could feel what was likely her head (though possibly her tush) pushing up on my right side. That would all suggest that the baby had put herself into a breech position. I’ve been trying some exercises and other home interventions to get her to turn. Last night one of the things I did got her to flip from the right side to the left – Lex and I both saw it happen; it was one of the weirdest things I’ve ever seen my body do. As of this morning I couldn’t really pinpoint her position. I’ve been getting pokes on the right and low down the left/near my cervix (some of those must be punches). She keeps getting the hiccups and I feel her banging into my left side just above my hip. A few minutes ago I got about a minute’s worth of strong kick-like movements on my upper right side again, and I think I can feel her legs and back, so I HOPE HOPE HOPE she’s settled herself back into a head down position and won’t turn again. I can’t see a breech position helping us achieve a VBAC. Please think good thoughts for us! Today I hit 32 weeks! Everything is going well, pregnancy-wise. I’m pretty big – I had a scan last week and was told that I have a good amount of amniotic fluid, which may account for my size. The baby is head down but must be sitting high up still since I’m still sleeping through the night without needing to go to the bathroom. It’s getting harder to move easily, though! We had a consult with the new OB-GYN practice last week. We weren’t impressed by the long wait (there was an emergency with another patient) or the decor (they share office space with an odd, religious fanatic dermatologist), BUT once we met the doctor I immediately felt comfortable. She was very open and honest with us about their philosophies about c-sections and the risks involved with a VBAC (but unlike my other doctor she gave me accurate numbers). This practice serves a big community of orthodox Jewish women, many of whom intend to have several children, and, as the doctor explained, the human body just cannot handle ten c-sections. That’s one of the many reasons why they work as hard as they can to make sure they don’t perform c-section unless absolutely medically indicated. The doctor we met with has a c-section rate of 9%, which is absolutely phenomenal. I’m not sure what the head doctor in the practice’s rate is, but I’m sure it is similar, as he is the one who owns the group and is the doctor I was referred to in the first place. The doctor did a quick scan to check on the baby (the heart rate was 155 bpm), had me get on the scale, and got a urine sample. Everything was great and we are definitely switching practices; I have my next appointment on the 20th. I will also deliver at Monmouth Medical center instead of CentraState, which is a good thing, given the c-section rates at each hospital. Lex and I have a tour of the maternity ward scheduled for November 2nd. We also decided to hire a doula to assist with the birth after all – more on that in a different post. None of this guarantees that I will have a successful VBAC, but I’m feeling more confident that if I do have another c-section, it won’t be because my doctor didn’t want to be up all night! The day after my appointment, I went to my previous doctors’ office to obtain my records. I filled out the form to give my written consent and was told I would get them within the 30 days they legally had to fulfill my request. This morning I received a call that the records were ready to be picked up and, by the way, I knew about the charge for having my records copied if I was leaving the practice, right? A DOLLAR per page, for a grand total of 71 DOLLARS! I was fuming when I was told this, but apparently they have the legal right to charge me up to 25 cents per page and a “reasonable” clerical fee. Is $53.25 a reasonable fee to copy a file? I’m not convinced, but I needed those records so I paid the fee anyway, making sure to express politely my displeasure at not being told about the fee ahead of time. The receptionist gave me a “break” and said, “Just give me $70 even.” How generous of her! Lex wants me to file a complaint with the US Department of Health and Human services, and I will, but I need to wait because I looked through my records tonight and found that they were incomplete! They didn’t include the charts of my weight gain or blood pressure from either pregnancy or doctor’s notes from my appointments. I don’t care about the notes as much but I think the other information is important. I want to take care of that before I file the complaint. I don’t understand what possible reason they could have for leaving those pieces of information out. I’m not an expert on HIPAA, but it was my understanding that as the patient I have the right to have access to my entire file. I did ask for a complete copy of my records, so I would think that would include everything. Grrrr. This only convinces me further that I have made the right decision to switch practices. I am so annoyed about this. In other pregnancy news, the baby’s heart rate was 146 bpm, I’ve gained about 18 lbs so far, and I PASSED MY THREE HOUR GLUCOSE TEST! Woohoo! We hit the 25 week mark on Monday; 5/8 of the way there! Things have been going very well recently. My colitis seems to be completely under control while on the extra medication, so as of next Monday I will start to wean off of it (slowly) to see if I can maintain remission without it. Woohoo! This baby girl is as active as her older sister was in utero, especially at night, and she’s very strong. My stomach bulges, jumps, and rolls all over the place. I’m pretty sure she’s turned head down for good now, since I haven’t had any bladder or cervical kicks in several days, but my rib cage is taking a beating. She doesn’t feel like she’s sitting quite a low as Anya was by the end just yet, but give her time, I suppose. Oh, and she gets raging cases of hiccups, just like Anya did, too. I’ve gained somewhere around 15 lbs so far – not too bad, although I did gain about half of that in the last five weeks. I’m still all belly, and it’s starting to get in my way. Squatting has become a huge challenge, and standing at the sink to wash dishes or trying to cook on the stove will soon require standing sideways or “Go Go Gadget” arms. I went for my glucose tolerance test today. People have all sorts of different reactions to needing to drink the stuff that they give you. For me, I start to get very lightheaded about 15 minutes after I’ve gotten it down, and then about ten minutes after that I become extremely drowsy, so much that I fell asleep in the waiting room of the lab until the technician called me in to draw my blood. Thank goodness my mom was there with me! I was out of it for much of the day today, too. I’m finally starting to feel better now. Too bad it’s bedtime! I should have my results in a few days. I hope, hope, hope I passed. 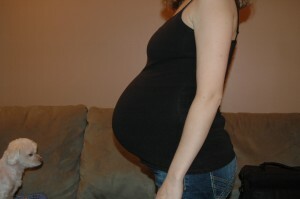 I’m 21 weeks and 2 days pregnant today! More than halfway there. Baby Girl Friedman has been kicking, jumping, and rolling all over the place. 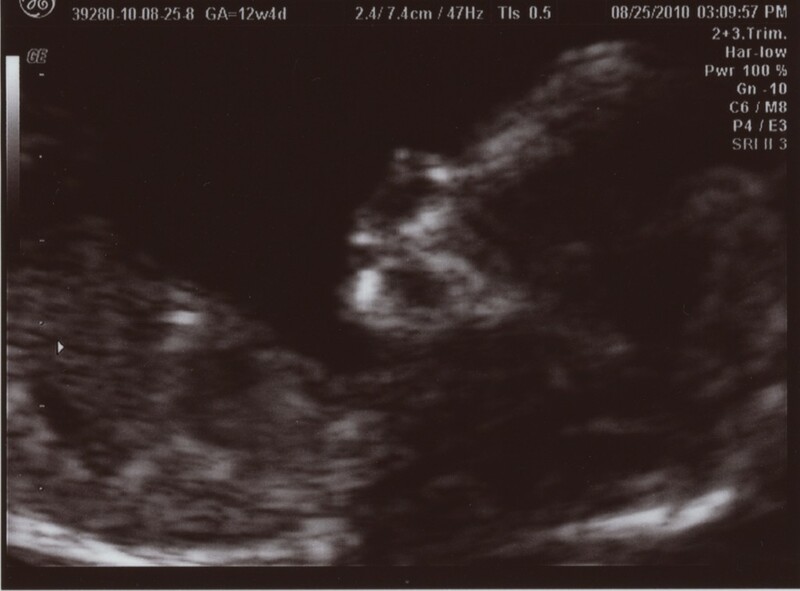 At our ultrasound she was head down, but she must have turned again because most of the jabs I get are sucker punches straight to my bladder. She’s pretty active, especially at night. I love that I can feel her move, but truth be told, it can get a little annoying to feel those lighter pokes over and over again – it’s almost like being tickled from the inside. I forgot to post this story from a few weeks ago: I had gone to Toys’R’Us one morning after dropping Anya off at daycare, hoping to find very low chairs to go with a table I had just built for her big girl room. I got there a few minutes before the store opened and was waiting outside the doors when a woman joined me. We stood there silently for a few moments, and then she turned to me and said, “You must be due any day now.” Shocked, I looked down at my belly and replied, “No, I’m actually not due until December.” She became very flustered (which I secretly enjoyed) and said, “Oh…well…uh…you’ve really popped!” I said something about how I showed early with my first pregnancy, too, and the conversation ended there. 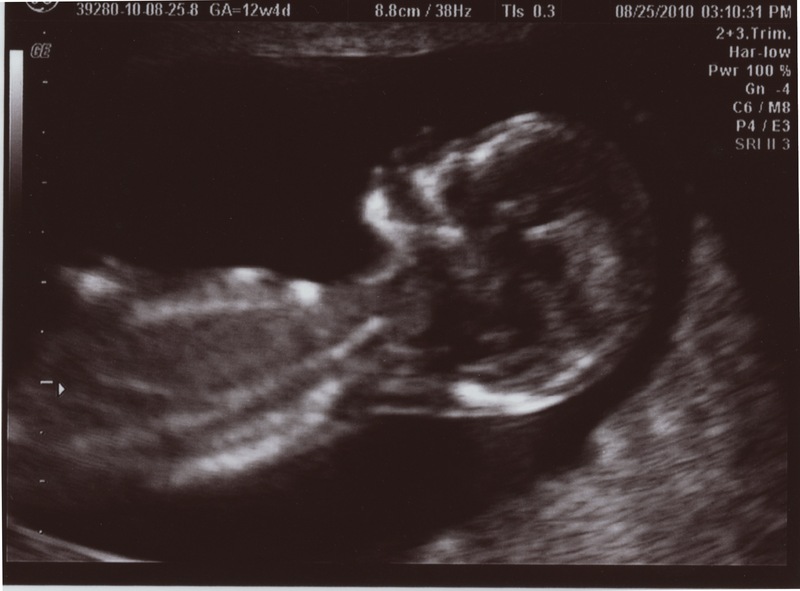 Now, I know I carried very far forward with Anya and always looked farther along in the pregnancy than I was, and yes, it seems that I will be repeating that experience with this baby, but come on! I was 18 or 19 weeks along, and if that lady thought I looked nine months pregnant then, how big am I going to be when I’m actually nine months?!? Then again, she probably wasn’t the brightest light bulb of the bunch. I don’t think I look nine months pregnant yet, do you? See even more belly pictures here! Tonight as I was putting Anya to bed, she asked, “Baby can hear it?” when I turned the CD player on for her bedtime songs. I said sure, we could let baby hear the music, too, and I moved my shirt off my belly for her. Anya put her head down on my stomach, said, “Okay, baby. Listen!” and then started to sing “Twinkle, Twinkle, Little Star” (trying her hardest to sing along with the music, something I never noticed her do before). It was such a sweet, tender moment, and it was hard not to get choked up. I hope very much that she will care for her little sister as much as she does now when she is actually here.